I have been reading this book - Land of the Seven Rivers by Sanjeev Sanyal for the last two weeks. I went slow, read a few pages at a time. This is the sort of book that needs slow reading. 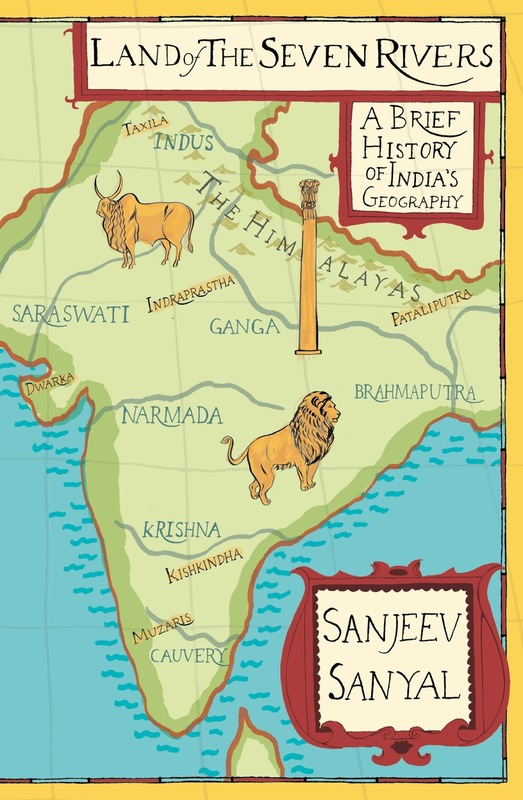 I am not saying it is a heavy read, but I would definitely say that it is brimming with information about events on the various events in the history of India that eventually had a geographical significance. Hence, one should take their time to grasp and understand it. I should apologize to Think WhyNot Group, who send me the review copy of this book on behalf of the author, for taking more than the due time to read and review this book. India has been known throughout the history as the land of seven rivers. The tagline of the book says - "A Brief History of India's Geography". That itself is intriguing. Indians have bad memories of the partition which resulted in the creation of our country along with our neighbours. Various regions of the country are still under territorial dispute with the neighbouring countries. Major ethnic groups are asking for division and creation of states for themselves. Hence, a knowledge of India's historical geography is a must for all Indians. The blurb asks interesting questions. Did ancient India witness the great flood? Why did Buddha give his first sermon in Sarnath? How did Europeans map India? It is very possible that these questions never crossed our minds, but they are sure to ignite your curiosity once you come across them. The author delves deep into our history to find answers about our geographical history. He talks about Indus Valley Civilization, the Mauryan empire, various dynasties that ruled the country, the British rule, partition, and much more. He also talks about the battle of Kurukshetra. The geographical history of our country is very much entwined with the political history and hence, one cannot segregate events into a particular category. The political events in history always had a geographical consequence and the author dwells on them to understand its significance. He also dwells on the tectonic movements of the earth's land that has over the ages changed the geography of the world. The book is full of interesting takes on the geographical changes that finally shaped India's destiny. You will feel enlightened once you have read it. Having said that I must add that the information in this book can be overwhelming at times. If you, like me, were never very strong in the subjects of history and geography, then you might have to re-read parts of the book in order to understand it properly. About the Author: A Rhodes Scholar, an Eisenhower Fellow, Sanjeev Sanyal is a global strategist in India's largest banks. He juggles between India and Singapore for work. He was named Young Global Leader by World Economic Forum. His first book, The Indian Renaissance: India's Rise After a Thousand Years of Decline was published by Penguin in 2008.